Hapkido is part of Korean martial art. It is a form of self-defense that employs joint locks, techniques of other martial arts, as well as common primitive attacks. One of the first things you must learn when studying the martial art of Hapkido is how to tie a Hapkido belt. This is important for several reasons. Tying a Hapkido belt is steeped in tradition. The martial artist’s belt is a symbol of his rank and accomplishments in Hapkido. A properly tied knot presented flawlessly is essential to convey the respect the belt and the martial art deserve. The Hapkido belt also keeps the Hapkido uniform closed while practicing the martial art. If you tie a Hapkido belt properly, it should stay tied until you untie it. Step 1 Find the center of the Hapkido belt by folding it in half. Place the two tips together and fold the Hapkido belt in the middle. Unfold the belt and place this center fold beneath your navel. Step 2 Bring the two ends of the Hapkido belt around your waist. Cross the two sides at the base of your spine and bring them around to the front from both sides. Pull both sides of the belt forward and check that they are the same length by touching the ends together straight in front of you. Step 3 Loop the left end of the Hapkido belt under the center of the belt by your navel and your body. Bring it up and out of the top. The part of the belt you are looping should be pressed against the Hapkido uniform and pointing up. Step 4 Place your right hand on the side of the Hapkido belt you just looped and your left hand of the other side. Point both ends toward the ground and cross them in an “x” shape. The side of the Hapkido belt that you are holding in your right hand should be on top. Step 5 Loop the side of the Hapkido belt that you are holding in your right hand under the other side. Pull it through the loop. Grab an end of the Hapkido belt with each end and yank them in opposite directions hard. Pull as tight as you can to get a firm knot. The Hapkido belt will not get tighter as you pull. Check to see that the ends of the Hapkido belt are the same length. If they are not you must start over. 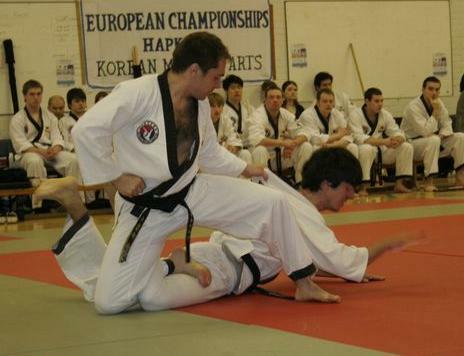 It is very important that your Hapkido belt have a uniform appearance.